We are a local green living magazine, but we like to think we’re more than that. We’re a magazine about hope. Like you, we’re aware of the environmental crisis, and we know things need to change. But we think that too often, the discourse about living sustainably falls into one of two extremes: either a list of wonderfully simple quick fixes (“change your lightbulbs and recycle!”) that don’t address the need for deeper change, or elaborate descriptions of “green lifestyles” that seem inaccessible to anyone who can’t afford to live in a yurt in Santa Cruz. At Fresh Dirt, we know green living isn’t always easy, but we do think it is nourishing and rich, as well as attainable. We see people all around us choosing to live sustainably out of joy, out of creativity, and out of passion. And we want to celebrate those who are already living this way, and to inspire and empower others to do the same. In Ithaca, we are lucky enough to be right in the middle of the green movement; the people moving us all towards sustainability are your friends and neighbors. That’s ultimately how we want you to think of Fresh Dirt: as a way to get to know your neighbors. A way to discover the extraordinary projects, works of art, businesses, protests, and ideas that are being created by the ordinary people all around us, and to celebrate the ever-growing connections between us all. 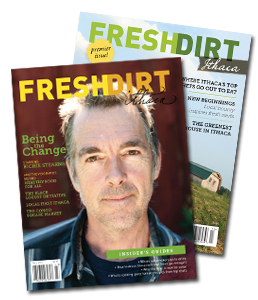 Get four issues of Fresh Dirt Ithaca for $19. Recipes, ideas, DIY projects, cartoons, games, and more! Fresh Dirt Ithaca is published quarterly in Trumansburg, New York, by Tommy Dunne Enterprises, LLC.